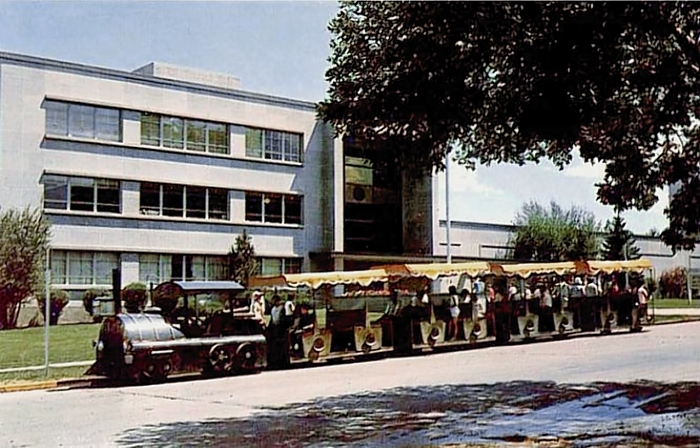 A postcard view of the "Last Chancer" tour train at the Veterans and Pioneers Memorial Building, late 1950s. 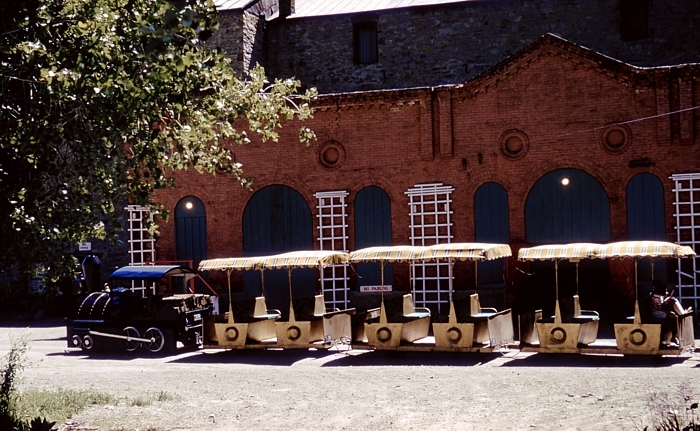 The tour train was created in 1954 under the auspices of "Helena, Unlimited", a not-for-profit corporation organized by the Helena Chamber of Commerce. 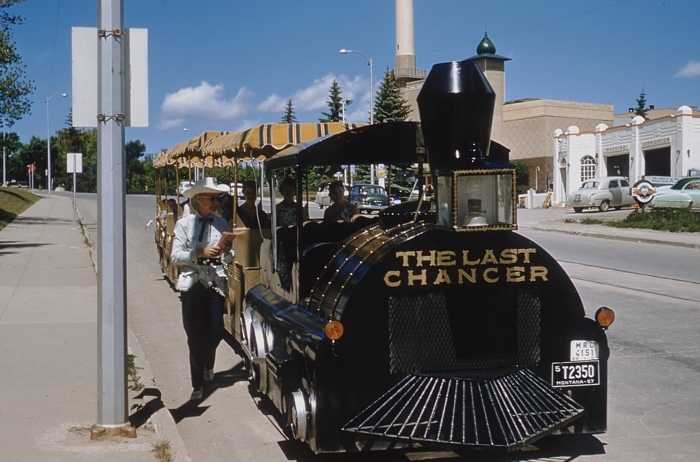 An updated " Last Chancer" still operates today, taking passengers on a narrated tour of Helena's historic sites. Contrary to what the tour guide might tell you, no outlaws were ever hanged from the trees on the Courthouse lawn; they hanged them from a tree a few blocks to the east. 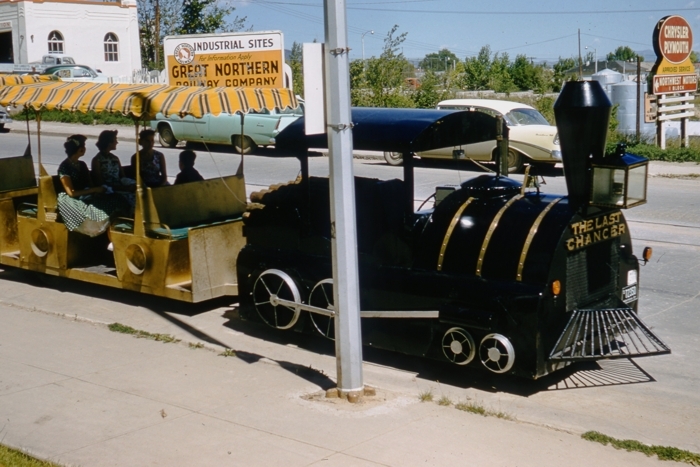 A city-wide contest was held in June of 1954 to name the train, which was at first little more than a gold-painted jeep pulling three cars. Some of the names suggested were "Sacajawea", "Gulch Express" and "The Six Shooter". The maiden run of "The Last Chancer" (winning name submitted by Mrs. S. J. Zahara) occured on June 15, 1954. For several years, tours began at the Great Northern depot (now demolished), at the intersection of Neill Ave. and Fuller. During the winter of 1954-55, the jeep was upgraded to look like a locomotive at the State Training School in Boulder. It was designed by Harold Jensen and executed by Clem LaVinge. Publicity photo of the first Last Chancer, taken at the Old Brewery Theater, June 14 1954. This was the day before the official inaugural run of the Tour Train. 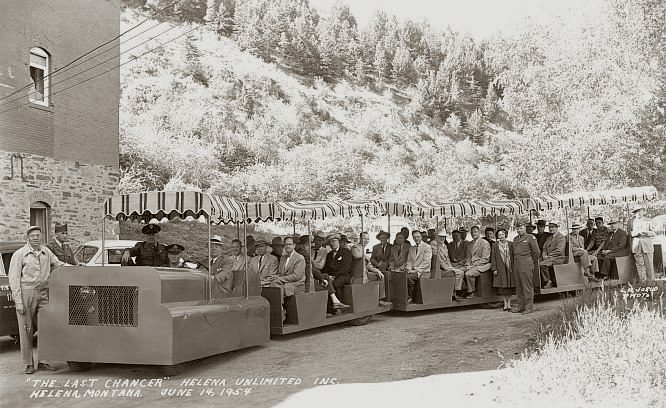 Seated on the train are numerous local notables of the day, including Montana Governor J. Hugo Aronson behind the wheel. The train made its maiden run the following day with H. S. "Hi" Dotson, Norman B. Holter, Mr. and Mrs. A. T. Hibbard, Mr. and Mrs. Marc Buterbaugh, Fred Heinecke, George Vucanovich, Vernon Cougill, Mr. and Mrs. John Quigley, James Dion, Harold L Paulsen, P. W. Singer, Neil MacLean, C. F. Mueller, Larry Graham, Mrs. Sherman W. Smith, Eugene Fehlig, John G. Thompson, Clem Meyer and Bryant B. Anderson aboard. 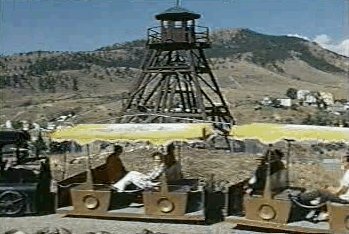 Two combined short video clips of the Tour Train in 1972, from the 1973 Helena Chamber of Commerce promotional film "Helena - City of Gold". Go back to "THE CAPITOL AREA"